This message was preached by Navaz D'Cruz at Word of Grace Church on January 6th 2019. To listen/download the audio please click here. To listen to the Sunday's worship and prophetic contributions please click here. I have a message, the burden of which has been increasingly growing in my heart as each year goes by. This year I have felt that God has laid this as a prophetic message for Word of Grace and maybe even beyond. I believe there is something in this message for everyone – a new believer, a not so young Christ follower and a seasoned Christian like myself. This is also in line with the series that Colin is taking us through but coming from a different angle. Proverbs 29:18 Where there is no revelation/vision, people cast off restraint; but blessed is the one who heeds wisdom's instruction. 2 Tim 4: 7-8 7I have fought the good fight, I have finished the race, I have kept the faith. 8Now there is in store for me the crown of righteousness, which the Lord, the righteous Judge, will award to me on that day—and not only to me, but also to all who have longed for his appearing. 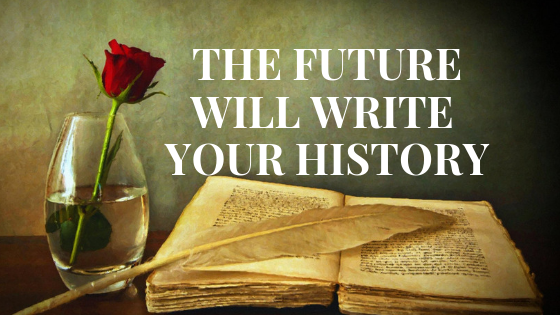 The title of my message today is this : The Future will write your history. Such amazing passion, dedication and fixed focus. We may never become a Jim Elliot and that does not disqualify us or excuse us from living with purpose, passion and a perspective that ends in eternity. What legacy will you leave behind? You will leave one behind either unintentionally or by design. 1. We were created on purpose for a purpose. A creator who has a design in mind created you. You are not here by chance or by an accident. You are not a mistake. You knit me together in my mother’s womb.14I will praise You,for I am fearfully and wonderfully made. Eph 2:10 10 For we are God’s handiwork, created in Christ Jesus to do good works, which God prepared in advance for us to do. This is critical to your purpose. Unless you are reconciled to your creator, you will never be free from a useless existence and be able to begin to live this purposeful life and fulfill your God given destiny here on the earth. As Christians, we too can live like this – carelessly, without vision/purpose and a revelation of why we are here on the Earth. Being saved is only just getting off the starting block of this eternal relay we are all running in. How then do we run this race? Many Christians sadly have lost their first love; their hearts have grown cold, distracted with the cares of this world. One day we will have to give an account for how we have lived. 1 Cor 3:12 If anyone builds on this foundation using gold, silver, precious stones, wood, hay, or straw, 13his workmanship will be evident, because the Day will bring it to light. It will be revealed with fire, and the fire will prove the quality of each man’s work. 14If what he has built survives, he will receive a reward. 15If it is burned up, he will suffer loss. He himself will be saved, but only as if through the flames. Proverbs 23:4 warns us not to wear ourselves out in trying to get rich. 2. The second issue is sustainability. Finishing strong is vital. Can we keep the fire burning after 2 years, 5 years, 10 years twenty 40? If I do not stay connected and rooted in Jesus my spiritual fervour, can wither off and die. 3. Building a legacy is in God’s DNA. Apart from the fact that God created you for a purpose, we need to understand the character and nature of God. He has put the same DNA in us as we are “His image bearers”. We have been created to create, care for and contribute to the earth. The command that God gave Adam to steward and multiply still holds good today. We are still commanded to create and care and contribute. This has to do with every area of our life: personal, at work, in the home, our marriage, children, neighbourhood, our material possessions, our spiritual life, church community. It is there in Genesis and is there is Revelation 22:12"Look, I am coming soon, bringing my reward with me to repay all people according to their deeds. Colossians 3:23 Whatever you do, work at it with all your heart, as working for the Lord, not for human masters, since you know that you will receive an inheritance from the Lord as a reward. It is the Lord Christ, you are serving. More than 40 verses talk about rewards. Look it up. This must be important. Before we get it twisted. We know that we have been saved by grace. When we know our identity, we will know our destiny. What version of Christianity will your children or grandchildren enjoy because of what you invested into the kingdom? Will it be a diluted version or even better than what you have known and experienced. Our ceiling should be the floor that the next generation stands on. Legacy builders think about the quality of their life not so that they can enjoy a good life on earth but so that generations after them can reap the fruit of it too. Are you a legacy builder? Mature sons and daughters in the house of God will learn to broaden their shoulders and be burden bearers rather than be a burden. When we know that, we are children of God bought at a high price we will realize that our lives are about stewardship and not entitlement. This is a difference between stewardship and Entitlement. Which column do you have more ticks? ENTITLEMENT- A child of God with poor identity. Word of Grace can be like a greenhouse- as long as you are in this church you thrive spiritually or may appear to thrive. This is because the external environment is influencing you and acting upon you. But if you move away from WOG will you continue to burn hot for Jesus? How much you internalize of the values you enjoy at WOG depends on your capacity to absorb and put into practice and make it your DNA. You have to forge your own history with God. Everyone’s character will be put to the test in the crucible of crises. Will you come out as pure gold? This, will be tested when the storms of life hit us and they will. Will we be like the wise builder or the foolish one? My prayer is that we like Paul will be able to say I have fought the good fight, I have run the race and now there waits a crown for me. HERE ARE SOME KEYS THAT WILL HELP IN YOUR LEGACY BUILDING. 1. PRESENCE – I cannot emphasize this more. That is why the first phrase in our tag line is Enjoying God. Apart From Him, we can do nothing. We need to stick close to Jesus every day. Practice his presence as a lifestyle. 5. PASSION – Put your might behind everything you do. Do it as unto God. “If you can’t fly, then run, If you can’t run, then walk, If you can’t walk, then crawl, but whatever you do, you have to keep moving forward.” –Martin Luther King Jr. This passion can only be sustained and fueled, in the presence of God. 1Cor 15:10 But by the grace of God I am what I am, and his grace to me was not without effect. No, I worked harder than all of them— yet not I, but the grace of God that was with me.
. Do you recognize that you have been created by design? What unique gifts and talents has God blessed you with?
. HAve the core values we talk about at Word of Grace become yours? Or is it an extranl influence? What are some of the goals you have for life?
. Are you a legacy builder? What will you change to become more focused and live purposefully? Do you have a year plan and a 5-year plan?
. What will you do differently in your Christian calling to leave a legacy behind? Thank you Ranjit. Coming from you means a lot!